People love’em… kids thrill to see ’em, and they just never cease to amaze. They’re meteor showers and it’s happening right now so head out in the backyard, set up and let’s take a look. Most important: a dark sky. Here’s the first thing – the main thing – you need to know to become as proficient as the experts at watching meteors. That is, to watch meteors, you need a dark sky. It’s possible to glimpse meteors from the suburbs. But, to see the most meteors possible, avoid city lights. Know your dates and times. You also need to be looking on the right date, at the right time of night. Meteor showers occur over a range of dates, because they stem from Earth’s own movement through space. As we orbit the sun, we cross “meteor streams.” These streams of icy particles in space come from comets moving in orbit around the sun. Comets are fragile icy bodies that litter their orbits with debris. When this cometary debris enters our atmosphere, it vaporizes due to friction with the air. If moonlight or city lights don’t obscure the view, we on Earth see the falling, vaporizing particles as meteors. 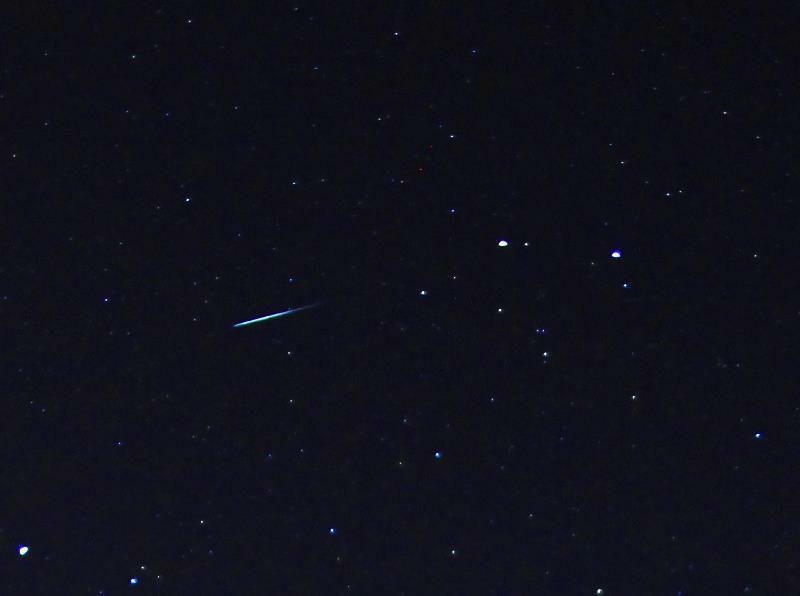 The Lyrids take place between about April 16 and 25. The peak morning in 2013 should be April 22, but you might catch Lyrid meteors on the nights around that date as well. Where to go and what to bring. You can comfortably watch meteors from many places, assuming you have a dark sky: a rural back yard or deck, the hood of your car, the side of a road. State parks and national parks are good bets, but be sure they have a wide open viewing area, like a field; you don’t want to be stuck in the midst of a forest on meteor night. If you want to bring along equipment to make yourself more comfortable, consider a blanket or reclining lawn chair, a thermos with a hot drink, binoculars for gazing at the stars. Be sure to dress warmly enough, even in spring or summer, especially in the hours before dawn. Are the predictions reliable? Although astronomers have tried to publish exact predictions in recent years, meteor showers remain notoriously unpredictable. Your best bet is to go outside at the times we suggest, and plan to spend at least an hour, if not a whole night, reclining comfortably while looking up at the sky. In 2013, moonlight will not pose much of a problem for the May Eta Aquarids, the August Perseids, October Draconids and November South Taurids. There’s moon-free viewing time for the January Quadrantids, April Lyrids and July Delta Aquarids. The full moon gets in the way of the November Leonids. Our almanac page provides links for access to the moonrise and moonset times in your sky. This shower has a relatively broad maximum but is expected to show the greatest number of meteors before dawn on May 5. The waning crescent moon should not really intrude too greatly on this year’s Eta Aquarid show. At northerly latitudes – for example, in the northern U.S. and Canada, or northern Europe – the meteor numbers are few and far between. 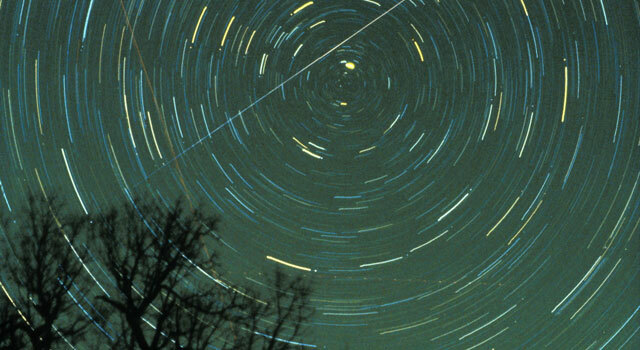 In the southern half of the U.S., 10 to 20 meteors per hour might be visible in a dark sky. Farther south – for example, in the Southern Hemisphere – the meteor numbers increase dramatically, perhaps two to three times more Eta Aquarid meteors streaking the southern skies. For the most part, this is a predawn shower. The radiant for this shower appears in the east-southeast at about 4 a.m. local time (the time at all locations) and the hour or two before dawn offers the most meteors. The broad peak to this shower means that some meteors may fly in the dark hour before dawn for a few days before and after the predicted optimal date. 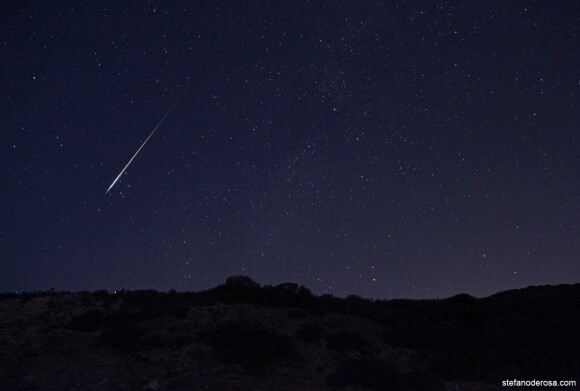 The most meteors will probably rain down on May 5, in the dark hours before dawn. Like the Eta Aquarids, this shower favors the Southern Hemisphere, and the tropical latitudes in the Northern Hemisphere. The slight waning gibbous or last quarter moon will obtrude on this year’s Delta Aquarid meteors. The meteors appear to radiate from the southern part of the sky, near the star Skat (Delta Aquarii). The maximum hourly rate can reach 15-20 meteors in a dark sky, but these rather faint meteors will have difficultly overcoming the moonlight this year. The absence of the moon in 2014 will make next year a favorable one for watching this late July shower. Unlike many meteor showers, the Delta Aquarids don’t have a very definite peak, despite the dates given above. Instead, these medium-speed meteors ramble along fairly steadily throughout late July and early August. An hour or two before dawn usually presents the most favorable view of the Delta Aquarids. Try watching in late July – but also early August, when the light of the waning crescent moon will be less obtrusive. Meteors are typically best after midnight, and luckily in 2013, the waxing crescent moon will set in the evening. 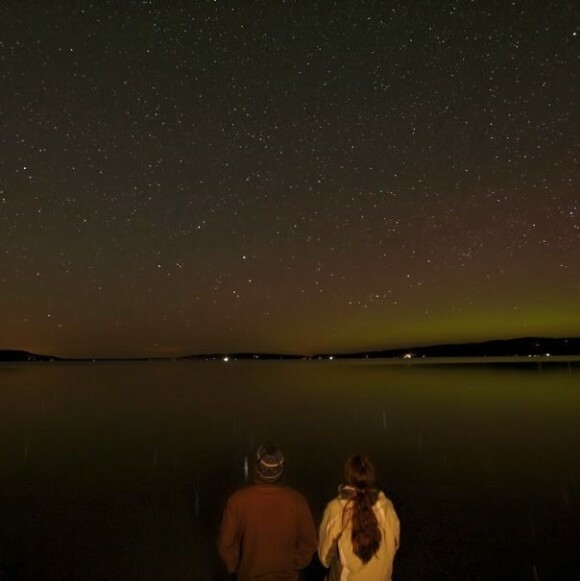 That means late night until dawn will provide dark skies for the Perseid meteor shower, one of the best meteor showers of the year for the Northern Hemisphere. You can get moonset times via this custom sunset calendar. The Perseids are typically fast and bright meteors. They radiate from a point in the constellation Perseus the Hero. You don’t need to know Perseus to watch the shower because the meteors appear in all parts of the sky. The Perseids are considered by many people to be the year’s best shower, and often peak at 50 or more meteors per hour in a dark sky. The Perseids tend to strengthen in number as late night deepens into midnight, and typically produce the most meteors in the wee hours before dawn. These meteors are often bright and frequently leave persistent trains. Starting in late evening on the nights of August 10/11, 11/12 and 12/13, the Perseid meteors will streak across these short summer nights from late night until dawn, with little to no interference from the waxing crescent moon. Plus the moon will be near the planet Saturn in the evening hours, giving a colorful prelude to late-night Perseid show. The radiant point for the Draconid meteor shower almost coincides with the head of the constellation Draco the Dragon in the northern sky. That’s why the Draconids are best viewed from the Northern Hemisphere. The Draconid shower is a real oddity, in that the radiant point stands highest in the sky as darkness falls. Unlike many meteor showers, the Draconids are more likely to fly in the evening hours than in the morning hours after midnight. This shower is usually a sleeper, producing only a handful of languid meteors per hour in most years. But watch out if the Dragon awakes! In rare instances, fiery Draco has been known to spew forth many hundreds of meteors in a single hour. The thin waxing crescent moon won’t cast enough moonlight to interfere with the show, so try watching at nightfall and early evening on October 7 and 8. This is not a favorable year for watching the Orionid meteor shower because of the bright waning gibbous moon. On a dark, moonless night, the Orionids exhibit a maximum of about 10 to 20 meteors per hour. 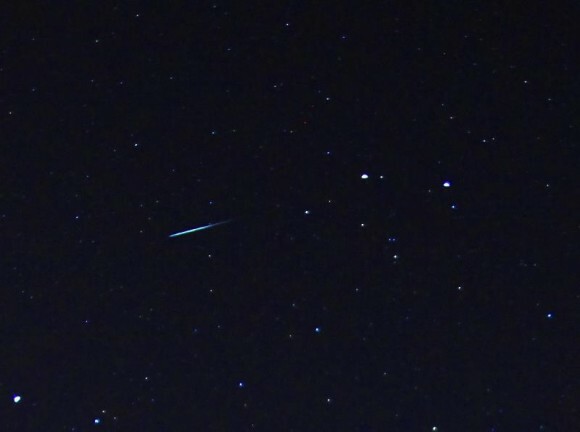 These fast-moving meteors occasionally leave persistent trains and bright fireballs, so you might see a few Orionids in the moon-drenched skies. If you trace these meteors backward, they seem to come from the Club of the famous constellation Orion the Hunter. You might know Orion’s bright, ruddy star Betelgeuse. The radiant is north of Betelgeuse. The Orionids have a broad and irregular peak that isn’t easy to predict. 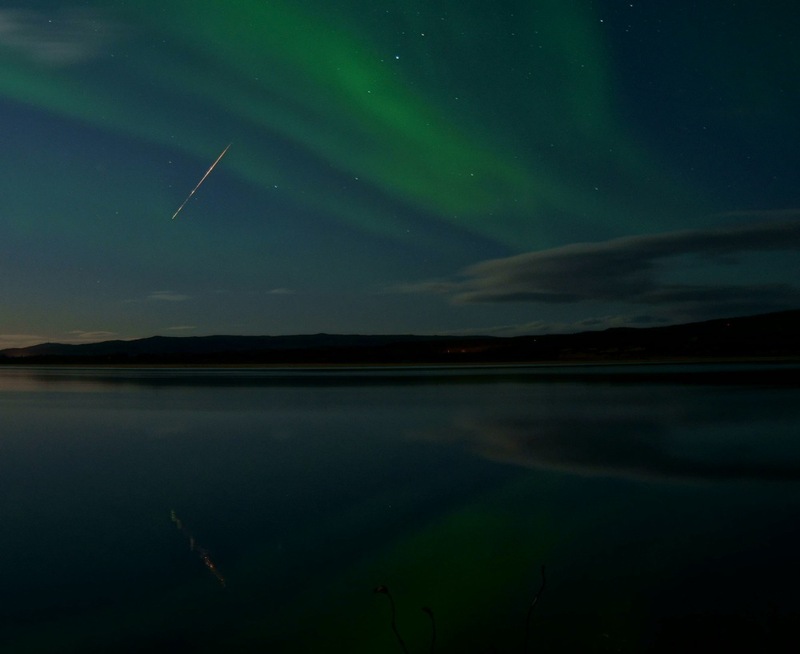 More meteors tend to fly after midnight, and the Orionids are typically at their best in the wee hours before dawn. The best viewing for the Orionids in 2013 will probably be before dawn on October 21. Try the days before and after that, too, sticking to the midnight-to-dawn hours.. The meteoroid streams that feed the South (and North) Taurids are very spread out and dissipated. That means the Taurids are extremely long lasting (September 25 to November 25) but usually don’t offer more than about 7 meteors per hour. That’ll be true even on the South Taurids’ expected peak night of November 4 (before dawn November 5), 2012. However, the Taurids are well-known for their high percentage of fireballs – exceptionally bright meteors. The other Taurid shower – the North Taurids – should add a few more meteors to the mix, but the forecast calls for the North Taurid shower to be raining down the most meteors a week from now, or in the second weekend of November 2013. Luckily, the thin waxing crescent moon will set at early evening, leaving dark skies for the peak night of the South Taurid meteor shower. The South Taurids are expected to produce the most meteors in the wee hours just after midnight on November 5. Remember, even a single bright meteor can make your night! The bright waxing gibbous moon will bleach out all but the brighter meteors during the evening and wee morning hours. But the moon will set in the wee hours after midnight, providing lots of predawn darkness for watching this shower. This shower is long-lasting (October 12 – December 2) but modest, and the peak number is forecast at about 7 meteors per hour. Typically, you see the maximum numbers at around midnight to 1 a.m., when Taurus the Bull moves nearly overhead. This year, you may want to wait till after moonset to view these rather slow-moving but sometimes bright North Taurid meteors. 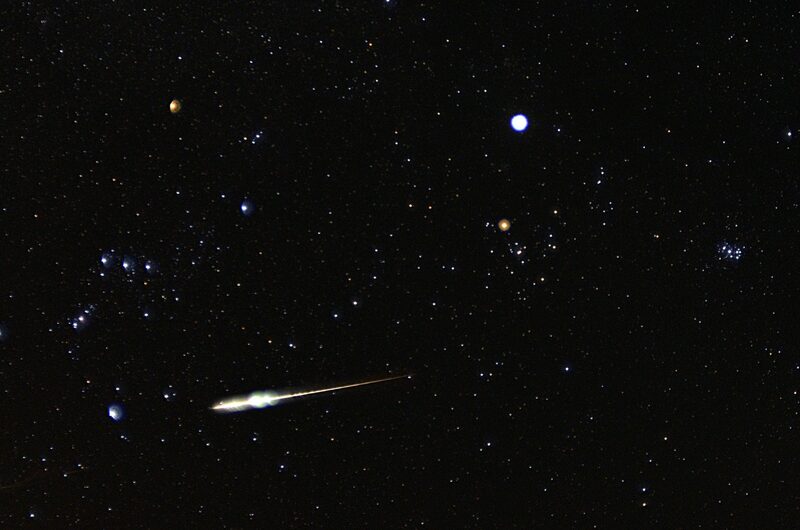 But you might even see some Taurid fireballs – even in the moonlight. The greatest numbers of North Taurid meteors can be expected just after midnight on the morning of November 12. But the days before and after that should produce some meteors as well.. Unfortunately, the full moon makes 2013 an unfavorable year for watching the 2013 Leonid meteor shower. Radiating from the constellation Leo the Lion, the famous Leonid meteor shower has produced some of the greatest meteor storms in history – at least one in living memory, 1966 – with rates as high as thousands of meteors per minute during a span of 15 minutes on the morning of November 17, 1966. Indeed, on that beautiful night in 1966, the meteors did, briefly, fall like rain. Some who witnessed the 1966 Leonid meteor storm said they felt as if they needed to grip the ground, so strong was the impression of Earth plowing along through space, fording the meteoroid stream. The meteors, after all, were all streaming from a single point in the sky – the radiant point – in this case in the constellation Leo the Lion. Leonid meteor storms sometimes recur in cycles of 33 to 34 years, but the Leonids around the turn of the century – while wonderful for many observers – did not match the shower of 1966. And, in most years, the Lion whimpers rather than roars, producing a maximum of perhaps 10-15 meteors per hour on a dark night. One of the finest meteors showers in the Northern Hemisphere, except that the bright waxing gibbous moon will obtrude in 2013. 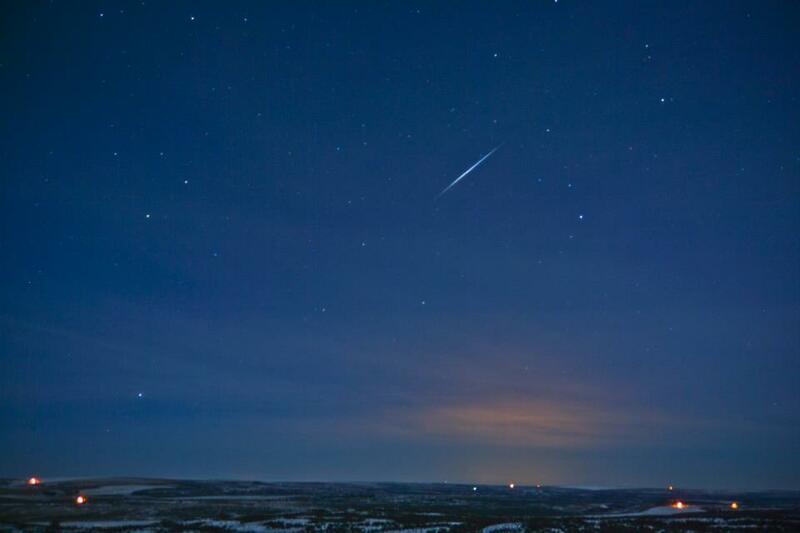 The Geminid meteors are often bright, so a decent number of meteors may be able to overcome the harsh moonlight. Or wait till after moonset, watching this shower from moonset till dawn.